Black tie is a euphemism for a semi-formal evening dress code otherwise known as DJ or dinner jacket – colloquially known as the ‘Penguin Suit’. Circa 1865 Edward, Prince of Wales – later to become Edward VII – had his tailor fashion an easier-fitting style of dinner jacket to be worn on less formal evenings at home or at his club. James Brown-Potter, a New York coffee broker, visited England in the summer of 1886 and was introduced to the Prince of Wales at a Court ball. He and his wife Cora were invited to dinner at Sandringham and on enquiring with the Prince what he should wear was referred to the Prince’s tailor who made him a dinner jacket. When he returned to America he introduced the dinner jacket to his country club Tuxedo Park. When various people started wearing the new jacket it quickly became known as the tuxedo or tux and spread rapidly throughout American ‘polite society’. Over the ensuing years various small refinements were introduced to both the tux and the dinner jacket which were virtually identical garments. The Americans created a white version for the hot summer months but this did not cross the Atlantic to Europe until fairly recently. With Global Warming and long hot summers in prospect it is only a matter of time before we in Britain start wearing white jackets at black tie ‘do’s’. They are already worn by orchestra conductors - pretty hot work - and are popular on tropical cruises and at School Proms. The 1930’s, became the era when the tux and dinner jacket reached a zenith of sartorial elegance. For those who enjoy ‘old films’, actors like Cary Grant and Humphrey Bogart stand out as the personification of classic formal wear in its heyday. Humphrey Bogart popularised the white tux which he wore in the classic film Casablanca. Britain has somehow managed to retain a lot of respect for classic or traditional black tie; and the upper echelons of society appear to be resisting the blandishments of a looser dress code for formal ‘do’s. In America, however, after the Second World War the tux started to change and by the mid 1950’s was moving away from its classic roots to become something quite different. In the words of Peter Marshall in Toronto, Canada in his excellent The Essential Black Tie Guide: "The British have traditionally viewed formality as a natural part of life while most Americans have treated it like an amusing novelty or an elitist obscenity since the 1960’s. What is the difference between black tie and a tuxedo? Fifty years ago the response would have been "nothing”'. Today the answer is "everything". When pastel colours were introduced to the dinner jacket in the mid-1950s the tuxedo began violating basic evening wear principles and thus ceased to be synonymous with black tie. The differentiation grew more pronounced in the subsequent decades as colour expanded into formal trousers and shirts, patterned fabric found its way into dinner jackets and bow ties gave way to four-in-hands. The increasing popularity of the tuxedo at afternoon weddings was yet a further breach of time-honoured etiquette. “Defenders of the DJ needn’t give up yet. Classic evening dress has seen off sterner challenges than a few overpaid wastrels who think wearing white shoes at an awards ‘do’ is an ideological statement. After all the DJ defeated Marxism” (A reference presumably to Ronald Reagan’s love of black tie and his successful negotiations with the Russians which resulted in the removal of the Iron Curtain). In Britain’s ‘polite society’ formal wear has remained largely unchanged over this period of sartorial upheaval in America. We still keep Morning Dress for afternoon weddings whereas in America they prefer the ‘new’ tux with its almost limitless variation. Classic black tie still has its adherents in the States and is far from defunct. However, since the turn of the century we have been invaded by a new ‘rage’ – a direct import from the States – the School Prom, an end of year celebration for school leavers. It’s been around in Cambridge and elsewhere for 15 years but only come into its own recently. 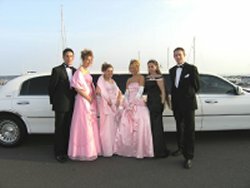 “The high school prom arrives in the UK (via stretch limo, naturally). Young men in shades and tuxedos step out of stretch limousines. Groups of expensively clad girls with tans as fake as their false nails exchange greetings in the glare of flash bulbs. It could be Oscar’s Night." But this is suburban Middlesex, not Beverly Hills, and the party-goers are 16-year-old school-leavers eager to celebrate the end of their exams. The American-style prom has arrived, pushing aside the old-fashioned disco at schools all over the country. Interestingly, school authorities have generally required or encouraged classic black tie for the boys rather than the less formal modern American tux with its almost limitless variation. Menswear retailers, of course, would love a free-for-all in sartorial fashion. It’s big business now and the kids want to show off. But there is absolutely no doubt that the girls look best against a backdrop of classic black tie – the girls, of course, enjoying sartorial freedom with the most beautiful, gorgeous long dresses ever created for teens. Known in the jargon as Prom Dresses.